Sketchbook Revival Video from Session 3. I signed up for this free online course because I need inspiration as I enter the last few weeks of my dominant hand wrist fracture with cast. 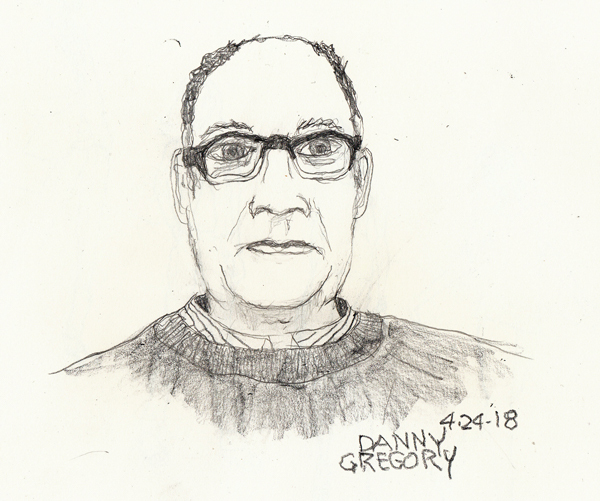 Danny Gregory, who I first discovered in the Fall of 2005, with his Yahoo Group Everyday Matters, made me realize how much I wanted to draw and paint in sketchbooks. I was partially retiring from Medicine that summer, and couldn't think of any skills I wanted to develop more. While watching his video in Session 3 of Sketchbook Revival, I sketched him - while he was talking. This was a new way of challenging me with my non-dominant hand and I used a simple 2B mechanical pencil, and a Sketch and Wash pencil without water for his sweater. 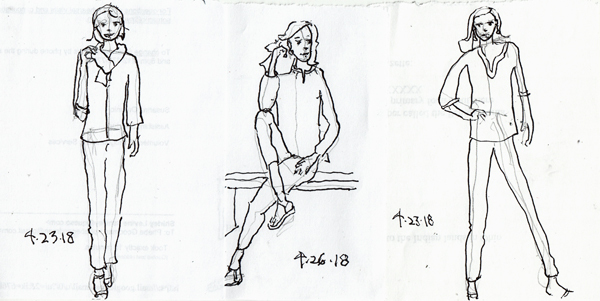 More "line of action" figure drawings from after breakfast: These are perfect little opportunities for me to sketch in pen on quarter sheets of copy paper after breakfast - using a Pilot G-2 10 pen. Before breakfast I haven't had enough coffee! I finally finished my last drawing from the exhibit at Galerie St Etienne. I wanted to use my brush pen again, because I have lots of difficulty controlling it, even with my dominant hand. For this I had to sit down and rest my book on a table, not on my cast. 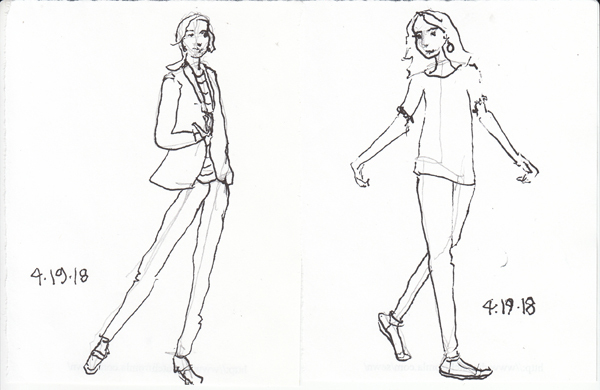 Line of Action Drawings: I like doing these small drawings on scrap paper (5.5 x 4.25") using photos from a clothing magazine. The pencil lines are the quick line of action/arms/legs, and then I draw the figure in ink. I'm periodically cutting them out with very fine scissors and my non-dominant hand, and collaging them into my non-dominant hand sketchbook. As usual, we found many masters that we wanted to copy. I sketched "Sleeping Woman" by Pechstein with my non-dominant hand. I also sketched "The Shepherdess," but need to finish it at home because we ran out of time. Before my fracture I was practicing "line of action" drawings as presented by Suhita Shirodkar in a Craftsy Class. 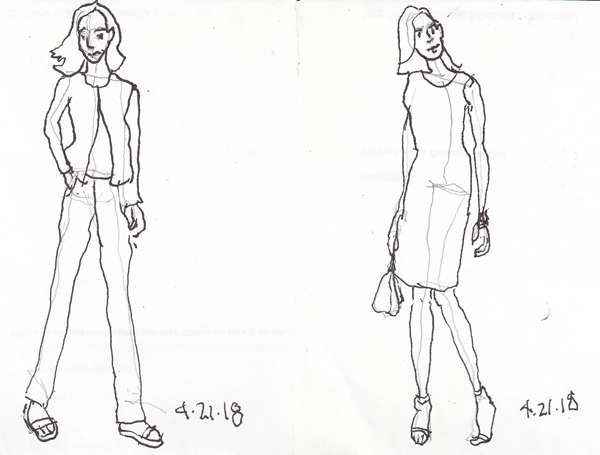 Yesterday I used photos from a clothing catalogue to practice the technique with my non-dominant hand. I made a quick line of action, concentrating on a line from head down to weight-bearing leg and foot, and then completed the drawing in ink. My pencil lines are still visible. I see my hand surgeon this morning, and hopefully will learn how many more weeks I will have my cast. 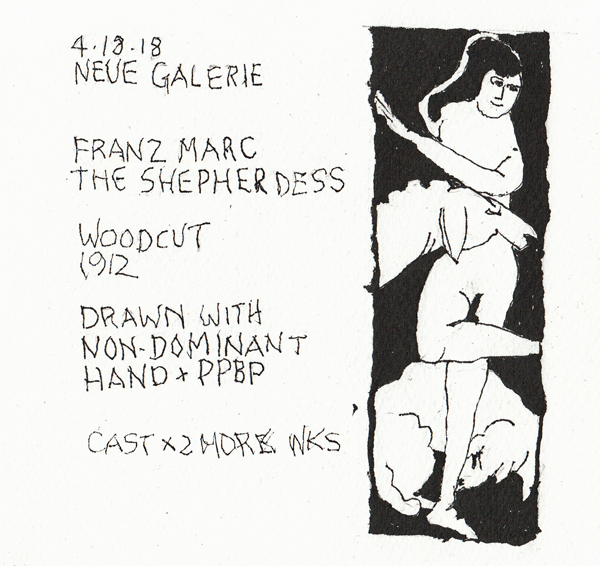 April 13th: I met my friends at Neue Gallery last Friday to see their new exhibit called Before the Fall: German and Austrian Art of the 1930s. I love their exhibits and brought my Hand Sketchbook so I had the option of making a sketch. I loved this image of a man and his dog from the painting by Rudolf Dischinger from his painting "Railroad Underpass." 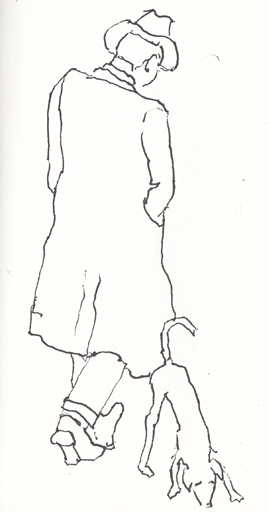 I had a few minutes to draw as our group was gathering and did a fast sketch of the Horse Carriage driver who was standing in front of me. 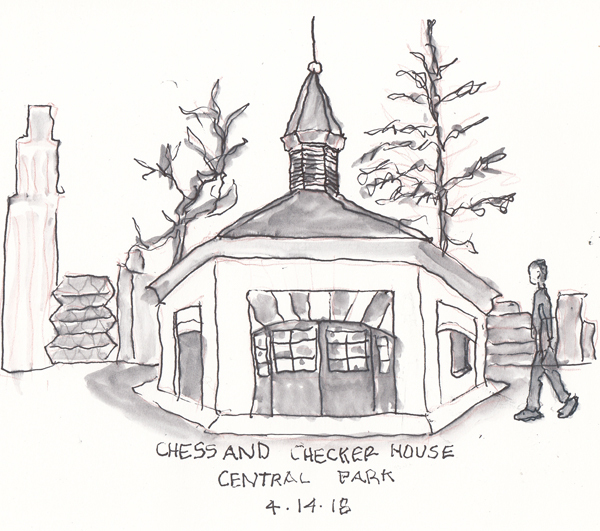 My final sketch in Central Park was done in the plaza around the Chess and Checkers House. I sketched this with a pen with non-waterproof ink and used a waterbrush to spread the ink. Spring is finally arriving in NYC, and I decided to sketch with the Central Park Sketching and Art Meetup group Saturday. We met at the 59th St and 6th Ave entrance to the Park and walked up the first hill, where there were a few early blooming flowers. 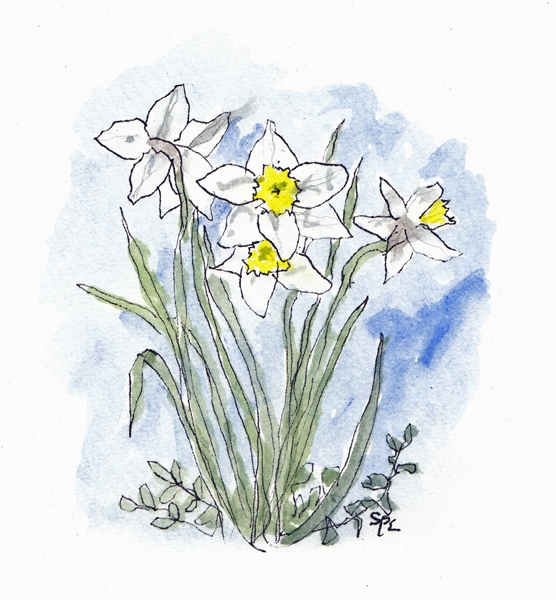 I used my regular daily watercolor sketchbook so I could paint for the first time since my fracture, and used a 05 Pigma Micron Pen for the drawing. I've missed painting and was thrilled that I could complete this page with my non-dominant hand - while sitting.